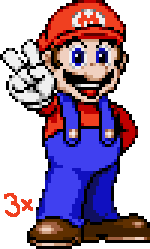 A sprite of Mario from scratch. Pictures for reference include the ending from Super Mario World for the SNES and a random, older picture of Mario doing this same sign. The earlier version from 2009 was too big compared to the fighting game scale characters I meant for him to stand with so I resized it and tried to improve a few things. Click the oddly colored picture below to see many of the steps I went through while making the 2009 version.